Awning Windows – A brief discussion. . . If you’re in the market for replacement windows or if you are building a home and are looking at window options, one of the most confused and overlooked windows is the awning window. Because of its relative obscurity, many people forget this window, (including designers and architects) and its ability to solve a myriad of problems. 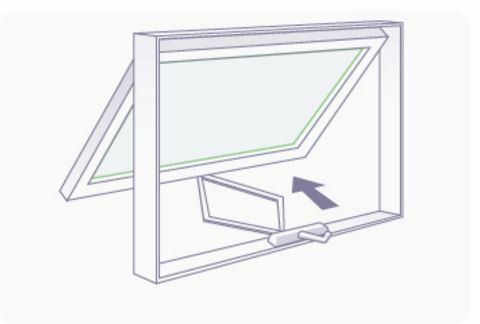 Here we will discuss the awning window, and its cousin the hopper window so that you can have the information you need to make informed decisions about what windows would work best in every location of your house based on the needs and wants for that particular room. Simply put, an awning window is a window that has a hinge at the top (header) of a window. This hinge allows the sash(moving portion of a window) to be pushed out usually 3 to 4 inches. There are several benefits and drawbacks to these windows so let’s discuss them separately. Benefit #1 – Ventilation/View preservation balance. In any frame situation the eye is automatically drawn to the center of an opening, picture or landscape. Therefore, when you look out a window, your eye is usually drawn to the center of the opening. Single hung windows and horizontal slider block the view with a center mullion going straight down the middle of your line of sight. This is a drawback to this type of window, so many people choose “fixed windows” or picture windows. The problem with this type of window is the loss of ventilation abilities. With an awning window, you can place it at the bottom of a fixed window or at the top depending on which portion of your view you are trying to preserve. This way, your eye is drawn to the center of the fixed window portion of the frame, thereby preserving your view, while allowing you to ventilate properly as well. Benefit #2 – Security. Awning windows only open a few inches so even if they are unlocked or left open, they are nearly impossible to get through without breaking the glass. Most awning windows are relatively wide, but narrow on the height. This makes it an undesirable entry point for would be intruders. Benefit#3 – Pizzazz. Awning windows have a different look, and will set your house apart from the thousands of homes in your neighborhood that are exactly alike. Even though they have been around a very long time, they have a modern appeal and will set a room off quite nicely. As a nice side benefit you can mix them with the previously mentioned “hopper window” which is a window that has a hinge on the bottom allowing the top of window to be tilted in. If you have awnings on one side of a room that will draw the breeze in, then hopper windows on the other side of the room it will push the breeze out and makes for an extremely efficient ventilation system. Drawback #1 – Cost. Yes unfortunately awning windows are more expensive than their sliding alternatives. The hardware that goes in to an awning window is sometimes cost prohibitive. Luckily you don’t have to use them everywhere, but just keep them in mind when picking your windows, it may solve a few problems for you. Drawback #2 – Restrictive. Awning windows offered by window manufacturers can be restricted in size options available. Most manufacturers only allow them to be 3 feet wide and usually no more than 2 feet tall. You can put 2 side by side if you need a wider opening but just keep in mind that you may have to be a little flexible with the sizes if you choose that route.